Which of the following cranial nerve of man is both sensory and motor? 5th cranial nerve (Trigeminal nerve): It is a mixed nerve. It contains both sensory and motor nerve fibres. It serves both sensory and motor functions. It’s motor fibres which arise from the floor of pons, supply the muscles of mastication. The sensory fibres bring sensory information of touch and taste from face, oral cavity and conjunctiva. 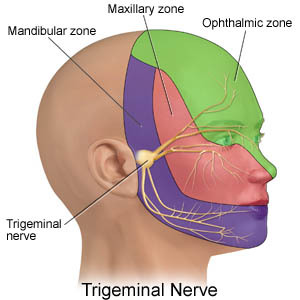 The trigeminal nerve bears a trigeminal ganglion at its base. The nerve is divided into three major trunks, sensory ophthalmic, sensory maxillary and motor mandibular nerves, which are distributed to the teeth, eyelids, many head muscles and skin of the head. Modern Biology By V. B. Rastogi, page no: 265 & Fundamentals of Histology By G. P. Verma, Page no: 177.